The Obama administration’s approach to the Israeli-Palestinian conflict was largely drawn from the same playbook as past US administrations. The United States twice arranged high-level diplomatic negotiations with the aim of an agreement on two states, Israel and Palestine. In neither case did the effort come close to bringing about that two-state solution. Obama, like most of his predecessors, was not interested in taking a different approach and using US leverage to try to compel Israel to make major concessions. At the start of his presidency in 2009, the key element of the US approach was getting the Government of Israel to commit to a freeze on construction in Israeli settlements in the West Bank. This initial approach collapsed when Israeli Prime Minister Benjamin Netanyahu refused. Eventually the two sides settled on a nine-month partial freeze that lasted until late September 2010. Israel continued settlement construction in East Jerusalem. Israel and the Palestinian Authority held brief high-level talks at the end of the partial freeze, orchestrated by Secretary of State Hillary Clinton. Palestinian President Mahmoud Abbas and Netanyahu themselves had only three meetings. Israel’s “security concept” included Israeli troops along the wall (or separation barrier) and in the Jordan Valley. However, the Palestinians were open to third-party troops, not Israeli ones, in the proposed State of Palestine. The map that Abbas presented called for Palestine in 98.2% of the West Bank, as well as Gaza. When the partial freeze ended in September, Washington tried to get Israel to extend the freeze. Egypt also tried to play a mediating role. In November 2010, the United States sought to convince Israel to commit to West Bank borders, and to set a second, 90-day settlement freeze. As an incentive, the United States would further bolster Israeli security in part by selling extra F-35 fighter jets. By the end of 2010, the United States had given up on a second freeze. A few months later, in May 2011, the President stated, “the borders of Israel and Palestine should be based on the 1967 lines with mutually agreed swaps, so that secure and recognized borders are established for both states.” Israeli leaders were displeased. Israel, Netanyahu said, would not pursue a “peace based on illusions.” The tension between Obama and Netanyahu also fed divisions within the American Jewish establishment. The second and longer US negotiating effort was under Secretary of State John Kerry in 2013-14 during Obama’s second term. While the talks lasted longer and were more intensive, they too ended without an agreement. Several months of direct Israeli-Palestinian talks gave way to talks where each side met separately with the United States. Brief optimism in January 2014 (“Mr Kerry’s methodical midwifery may be paying off,” wrote The Economist) gave way to crisis: Israel reneged on a promised release of Palestinian prisoners, the Palestinian Authority signed letters of accession to 15 international treaties, and, in late April, the two major Palestinian factions (Hamas and Fatah) agreed to reconcile. Concerted US efforts just to keep the process going failed. During the months of talks, the United States initially hoped for a framework agreement that would lay out the parameters on core issues like land, Jerusalem, refugees, settlements and security. The United States later went to Plan B, drafting an agreed framework for the negotiations. When that too failed and the process fell apart, Kerry said he would publicly share areas of progress, but he never did. In one of the major accounts of the negotiations, the authors argued that the key moment was in February 2014 when Abbas decided the United States was bending over backwards to appease Netanyahu and that this process would not lead to peace agreement. Netanyahu’s positions on the Jordan Valley, defining Israeli settlement blocks, and Palestinian recognition of Israel as the Jewish State meant his bottom line was far from the Palestinian minimum. As we near the end of the Obama administration, the president is likely to leave office without solving the Israeli-Palestinian conflict, just like previous U.S. presidents. Obama could have tried to coerce the sides, especially Israel where the United States has tremendous economic, military, and political leverage. But he did not and so the notion that the United States could pressure Israel into making the necessary concessions for a two-state solution remain untested, just as under previous administrations. Washington also never entertained another radical shift, embracing a one-state solution with equal rights for all people in Israel, Gaza, and the West Bank. The Obama administration was not dealing with an especially favorable political environment. Mahmoud Abbas is long past his presidential term in office, and he has only limited political support. Palestinian politics are politically and geographically divided between Fatah and Hamas. Many states in the region remain mired in civil conflict, including Libya, Yemen, Iraq, and Syria, Israel’s immediate neighbor. Millions of people have been displaced by war. Palestinian political fragmentation, Hamas militancy, and regional chaos have not been conducive toward making or selling core concessions. Meanwhile, Benjamin Netanyahu remains skeptical of a two-state solution, at times directly rejecting it and at times highlighting so many conditions that a deal would be impossible. 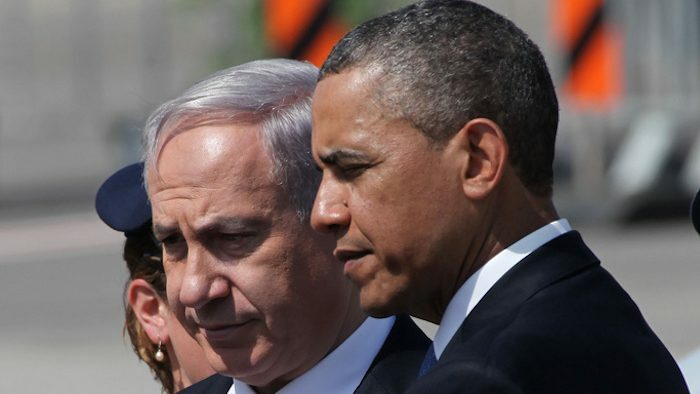 Obama and Netanyahu had the worst relationship of any US president and Israeli prime minister, but the underlying strategic relationship has not changed one iota. US aid and support continued to flow to Israel. The two leaders disagreed repeatedly on core policy issues like the peace process and the nuclear negotiations and agreement with Iran, but the Israeli-U.S. alliance remained the same. In Obama’s last year in office, the two governments were negotiating a new ten-year commitment of tens of billions of dollars of US military aid to Israel. The next US president will come into office just months before a major milestone, the 50th anniversary of the June 1967 Arab-Israeli War. The two-state solution, and the land-for-peace principle that it embodies, will remain the publicly preferred Israeli-Palestinian resolution, but the pathway to it is likely to be as elusive as ever. Obama failed to change that, but maybe he can look for consolation to the records of Carter, Reagan, Bush (41), Bill Clinton, and Bush (43) who also sought but did not achieve a resolution. Dan Ephron, “16 Hours in September,” Newsweek, December 11, 2010. [also appears on web without Ephron byline] For other examples of Netanyahu or an Israeli official who refused to look at Abbas or Palestinian proposals, see Ben Caspit, “Rejectionist Front,” Ma’ariv, January 3, 2010 [via coteret.com]. See also Akiva Eldar, “Palestinian negotiator: Israel presented no position or offer in Amman talks,” Ha’aretz, February 24, 2012; For a contrasting view on the January 2012 talks in Amman, see Barak Ravid, “Netanyahu’s border proposal: Israel to annex settlement blocs, but not Jordan Valley,” Ha’aretz, February 19, 2012. “Inside the seven-hour Clinton-Netanyahu marathon meeting,” foreignpolicy.com, November 15, 2010. See also Barak Ravid, “Kerry says he will publicize ‘progress’ made in peace talks,” Ha’aretz, May 1, 2014. Ben Birnbaum and Amir Tibon, “How the Israel-Palestine Peace Deal Died,” New Republic, July 20, 2014. Another review is Jodi Rudoren and Isabel Kershner, “Arc of a Failed Deal: How Nine Months of Mideast Talks Ended in Disarray,” New York Times, April 28, 2014, http://nyti.ms/1nAGzeq. See also Larry Derfner, “U.S. post-mortem on peace talks: Israel killed them,” +972 Magazine, May 2, 2014, http://972mag.com/u-s-post-mortem-on-peace-talks-israel-killed-them/90371/; Ron Kampeas, “Anonymous interview airs U.S. frustration with Israel after talks’ collapse,” Jewish Telegraphic Agency, May 6, 2014; and Jamie Stern-Weiner, “Indyk vs. Indyk,” Middle East Research and Information Project, May 12, 2014. Jeremy Pressman, PhD, is an associate professor of political science and director of Middle East Studies at the University of Connecticut. He is author of several books and articles, including “American Engagement and the pathways to Arab-Israeli peace,” Cooperation & Conflict 49:4 (2014), pp. 536-553. He is on twitter @djpressman.